The long running June in Buffalo summer festival has seen two directors over its 25-year history. 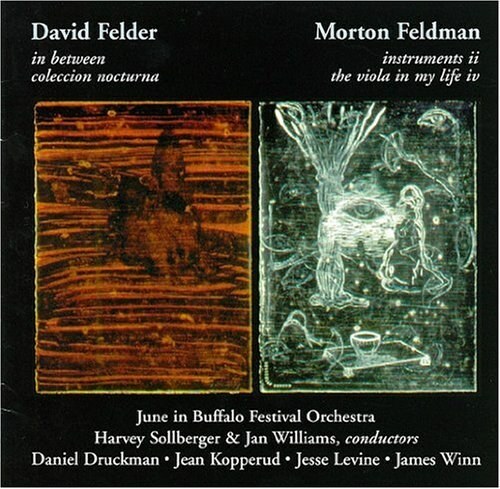 This disc contains music for orchestra and chamber orchestra (with and without soloists) composed by both these individuals, Morton Feldman and David Felder. The latte's selections are widely spaced chronologically. Coleccion Nocturna (1983-84) is essentially a double concerto, featuring a highly prominent solo part for a clarinetist (playing bass and soprano instruments) and a somewhat more subsidiary one for pianist. The piece exists in versions with backing by either chamber orchestra or tape, and it's the former that appears here (the smaller-scale one is found recorded on the Mode label CD ...a pressure triggering dreams...). The sound world is unabashedly East Coast, though quite colorfully scored and mindful of dramatic shaping. Clarinet writing is especially showy, shot through with klezmer inspired special effects such as wide vibrato and pitch bends. Written fifteen years later, In Between demonstrates a softening of the Atlantic seaboard sonics to include triadic entities and a further heightened sense of gripping profile. The featured percussion part is less a true solo line than a semi prominent obbligato, emerging periodically from the surrounding textures like an occasionally breaching whale sighted during a harbor cruise. In some ways, it can be seen as a response of sorts to vintage items from Feldman's oeuvre, consisting primarily of slowly unfolding vertical events that are varied and enhanced by vibrant orchestration and filigree. Structurally, the work traces a four-part format, with two large climactic peak areas preceded by more laid back material, the whole winding up in a brief atmospheric coda. Both are excellent listens. Feldman's pieces, though composed within a few years of each other during the early 1970's, show significant differences. Instruments II (1975), for a chamber ensemble largely bereft of strings, is the sort of work one typically associates with this vanguard minimalist: unrelentingly soft in dynamics and concerned texturally with largely unadorned dissonant chords surrounded by silences, scattering occasional disjunct melodic fragments throughout. The usage of horizontal motion by half step (at times interspersing major seconds), both in the small tune snippets and chord progressions, serves as an effective unifying device. Scored for full orchestra and viola soloist, The Viola in My Life IV(1971) makes more conspicuous use of melodic gestures, not only in the solo part but in the accompaniment as well (note the recurring pizzicato fragments in the cello and contrabass, as an example). And while still prevailingly quiet, the piece does rouse itself to put forth some sections marked "forte." In this sense, it hearkens back to Feldman's earlier output such as Rothko Chapel. Both works possess this compose's signature intuitive-yet-perfectly-right sense of balance and pacing. They're essential works, as is true of most Feldman. Performances are excellent. Top shelf efforts are turned in by soloists Daniel Druckman (percussion), Jean Kopperud (clarinets), Jesse Levine (viola), and James Winn (piano). The June in Buffalo Orchestra (a freelance group cobbling together regularly performing guests of this festival), ably led by Harvey Sollberger and Jan Williams, puts forth a well drilled, sensitive sound. Both production and sonics are professional all the way. This fine disc is very strongly recommended.